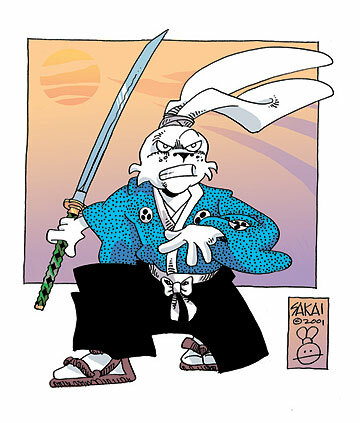 In early March, "Usagi Yojimbo" creator Stan Sakai joined Sergio Aragones, Mad Magazine cartoonist and "Groo the Wanderer" creator, as a guest at the XI Salon del Comic de Granada festival in Grenada, Spain. Sakai provided the Star-Bulletin with the following account of his week-long trip. Sergio Aragones and I had been invited to the XI Salon del Comic de Granada. I had met Alejandro Casasola Medina, the festival director in 2004 when Sharon and I were guests of the Expo Comics festival in Madrid. I was not able to accept his invitation for 2005, but he was kind enough to extend one for this year. We met at LAX at 8 a.m., Monday, March 6 for a 10:06 Continental flight to Newark, NJ. The boarding agent recognized Sergio, and asked him to autograph his boarding pass. I thumbnailed the story for Usagi Yojimbo #96 on the flight, while Sergio worked on gags for "A Mad Look at Cats." We had a two-hour layover in Newark, so we had a leisurely wait for our connecting flight to Madrid. Everything was going smoothly, that is until we reached the Madrid/Barajas Airport. We were to collect our luggage at Barajas, and recheck them at Iberia Airlines for the last leg of our flight. We had an hour layover, which is less than what I am usually comfortable with. However, I had done it in the past, when I claimed my bag, walked it over to the nearby Iberia counter to recheck, then sauntered over to my departure gate. That was before the expansion. We found out that Iberia's new Terminal 4 was about 5 miles away, accessible by shuttle bus, and our bags took half an hour to arrive at baggage claim. I have to say that in a situation like this -- lost and confused in a Spanish airport -- there is no one I would rather have with me than Sergio. He hurried us out, bypassed the bus for a speedy cab, promising the driver a hefty tip we streaked over to the new terminal, and got there in what must be record time. Upon checking in, we were told that we could not make it to the flight. Even if we zipped through security, the gate was just too far away. 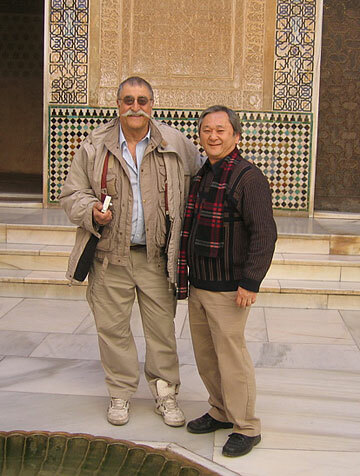 Sergio Aragones, left and Stan Sakai at the Grenada festival. The next flight would leave at 1610 hours; that is, 4:10 p.m. It was now 11:15. There was just a short line for security, and we entered the vast new Terminal 4 and a five-hour wait. We weren't sure exactly what our gate would be -- according to our tickets it was either gates at H, J, or K. It seemed that the airlines at the new terminal were just as confused as travelers. But we had time -- lots of time. We explored for awhile, traveling down four escalators to the cavernous lower level, and the train that could take us to Gates M, N and O. We went back up and found signs directing us to a business center where, presumably, we could use a computer to send an e-mail to Alejandro. The signs disappeared after a short while, so we inquired at the Iberia VIP lounge and was told that there certainly is a new business center, but outside the security checkpoint. It is so new, in fact, that they do not yet have computers. The agent offered us the use of one of the lounges for 7 Euros an hour. It was the slowest computer I have used since my old PC died years ago. But we managed to send an e-mail to Alejandro. I also sent one to Sharon, telling her that we had arrived. Looking through my inbox, I found an invitation from a bande dessinee festival in Nimes taking place in May. Best of all, the invitation extended to Sharon as well. I had heard of Nimes, but not in connection with any BD festival. It is in the south of France, started as a Roman colony. There are old Roman buildings, and even a colliseum. During the early 19th century, they had provided a fabric that was first used for tents, then for clothing miners and slaves. That cloth became known as denim -- "de nim" meaning "of Nimes." We left the lounge and Sergio called Charlene. The boards said our departure had been moved to Gate M23, and we elevatored down and caught the train. Less than an hour before departure, a voice over the intercom spoke in Spanish. Sergio and the other passengers groaned. An Engish voice this time: Our gate had been moved to K64. We all hurried over, caught the train, took the elevator, and found ourselves with the other bewildered passengers outside the security check point with a huge mob of people vying to get through. What could we do? We joined the mob. I have to admit, for the amount of people there, the line went pretty fast. I was behind five little old Spanish ladies who could find and zip into small openings in the crowd faster than Apollo Ohno sliding into the pole position in a short track skating competition. We finally made it through, rushed to our gate, hurried down the stairs and onto the tarmac, caught the bus that took us to our waiting plane, and waited. They finally opened the bus doors and we poured onto the tarmac, and up into the plane, found our seats, and waited some more. We left the ground almost an hour after our scheduled departure time. We flew over miles and miles of olive groves. Mingled among the olive groves, were more olive groves. Sergio explained that the Andalucia area is the olive capital of Spain. As we were about to land after the 45 minute flight, we saw the beautiful snow-capped Sierra Nevadas. Alejandro met us at the airport. He did not see our e-mail, but reasoned that since Sergio and I were not on our scheduled flight, we would be on the next one. He drove us to the Corrala de Santiago, a beautiful hotel with an open courtyard. The building was originally erected in the 16th century. Columns in the courtyard are original from that time. The rest has been remodeled over the centuries. "Remodeled over the centuries" ... how many American hotels can say that? The Corrala now included a library, and computers with internet connections. Sergio and I walked down the street to a small market and stocked up on supplies. I bought a large bottle of water and a six-pack of Bitter Kas in bottles. Bitter Kas is my favorite soft drink but, as far as I know, it is only distributed in Spain. Alejandro collected us at 8:30, and we walked over to an Italian restaurant where eight of us had dinner. I had a passable pasta carbonara. It did not come with a raw egg, and had too much cream and parmesean cheese for my tastes. Alejandro did insist on ordering a pork kabab for Sergio and me to share. It was made of the pork of the acorn-fed black footed pigs that are used for the premium jamon, the cured ham that hangs in every Spanish restaurant. The pork was excellent, tender with a sweet, savory flavor. Dinner concluded with orujos, a thick, sweet after dinner liqueur that burned my tongue when the liquid first touched it. I am not a drinker by any stretch of the imagination, but I finished it in sips. The owner brought a second round. Then a third. Then a fourth. After the fifth, my tongue had completely burned off. We walked back to the hotel, and I plopped into bed. Sergio and I met downstairs at 7:30 and caught a taxi to the train station. We were going on a three-hour ride to Sevilla. I mostly tried to catch up on my sleep during the ride. Once in Sevilla, we felt adventureous and caught a bus into the city center, and walked past the gardens and neighborhoods to the largest cathedral outside of Vatican City. It is magnificient, built in a mixture of Moor, Renaissance, and Gothic styles. Christopher Columbus' sarcophacus is there, held aloft by four statues. We hiked 35 stories up a corkscrew ramp to the top of the Giralda, the tower, for an overview of the city. The city is exactly how I pictured a Spanish town to be -- white buildings with tiled roofs and a courtyard in every neighborhood. Sevilla was settled as a Moorish city, and its ornate designs can be found throughout. Even the cathedral began as a mosque in the 12th century. It was converted in the 13th century. We walked throughout the city center, stopping in shops, and eating at a pleasant cafe where I had my favorite Spanish lunch--a jamon sandwich and Bitter Kas. Sergio had a chorizo sandwich and beer, and we shared a bowl of local olives (garlicy and delicious) and a tortilla. Spanish tortillas are an egg and potato dish, completely different than what we are used to in California. Before we knew it, it was after three. We hailed a taxi and returned to the train station, and were back at our hotel before seven. We walked to the festival center, about two kilometers from the hotel. Japanese singer (J-pop idol) Yoko Ishida had arrived with her entourage, and we were all scheduled to take a nighttime tour of the Alhambra, the Moorish castle. I first met Yoko and her backup dancers at Anime Weekend Atlanta in September, so it was a coincidence that we were both invited to Spain. Even moreso, I will again see them next month in Hawaii as they continue their world tour. A bus drove us to the top of the hill, and we were met at the entrance by Lucia our guide. She told us the history and details of the castle in English and Japanese. Sergio had already visited the Alhambra four times, so had seen it all before. It is an amazing place. The Moorish detail work is beautiful. It was too dark to see the grounds which covers ten hectacres, but we toured the three castles -- the judiciary and beaureacratic one, the one in which visiting dignatries were received, and the harem where the sultan kept his four wives and up to 200 concubines. The tour ended at about 11 p.m., and Lucia escorted us to our waiting bus. We would like to visit the castle in the day to see all the detailing that we missed, and to visit the gardens. However, the presidents of Spain and Poland would be visiting it tomorrow, and we did not want to get caught up in the security that comes along with a state visit. The bus dropped Sergio and me off at the hotel, and continued on to a festival party. It was late, and restaurants were already closed. We went into the Cocina Bar, where a few locals were watching television and finishing their drinks. They were closed as well, but were willing to reopen their kitchen for us. They served us the best meal we have had since arriving -- local olives, a very savory pork fillet, tomatoes in olive oil, and the wonderful Spanish bread. Sergio and I went sightseeing in the city center. "Granada" means "pomegranate." The pomegranate motif could be seen throughout the city, from designs on the sidewalks, to low metal sidewalk posts called "shin busters," to souvenir items. The cathedral was not yet open, so we looked around the stores in the area. It was like a Moroccan bazaar, with narrow maze-like canopy covered streets. We made a few purchases, most notably some knives from a cutlery shop where they sharpened and polished the blades on grinding stones before you bought them. They were also remarkably inexpensive compared to those in the US, and just as good. I found a car for lunch buddy Mike Kazaleh. Mike collects Matchbox-type cars, and I like to visit hobby stores and pick one up for him whenever I am in Europe. The main cathedral is massive. The one in Sevilla, though much larger, had a quality of elegance to it. The Granada cathedral hit me with its weight and power. We could see the effect it would have on a peasant hundreds of years ago: The biggest structure he would have previously seen would have been a small hut, and now to enter such an edifice. How could he doubt the existence of God? Everything was on a massive scale, even the entrance doors were almost three stories tall. Next to the cathedral is the Sacristia Museum, where Ferdinand and Isabella are entombed. I was very surprised at her crown. I thought royal crowns were elegant and perfect, but hers was roughly shaped and had many patches in the gold. I guess that is the best that technology could do 600 years ago. The festival opened at 1700 (5 p.m.), so we left the hotel at 4:30. We dressed quite dapper, Sergio with a coat and tie (albeit a Simpsons tie). We were introduced to a few political dignitaries and the press, who were then escorted on a tour of the festival center. We also met two of the other guests -- Mike Collins and Duncan Fegredo from England. Then the public was let in. There were two very interesting exhibitions: one of Vasquez, a founding member of Spanish cartoonists and who had been a great supporter of the festival, and the other of Purita Campos. I was very impressed with artwork in the Campos exhibit. We wandered around the exhibitors area for awhile, signing books for those who came up to us. Expo Comics of Madrid had a booth, and I again met Emilio, its organizer, who I saw two months ago at Angouleme, France. Sergio and I walked back to the hotel, stopping at stores and a couple of churches along the way. We went to an El Corte Ingles chain department store, where he bought a new battery for his digital camera. I bought a six pack of Bitter Kas to bring back to California. We got back to the hotel, and I went to the computer room to check e-mail. I got an invitation to be a guest at a convention in Atlanta in September. A new, state-of-the-art aquarium just opened last November, and their Japan Festival takes place at that time, and I was not able to hike up the back of the Stone Mountain Civil War Memorial the last time I was there. I'm tempted, but will probably have to pass on it. We caught a ride to the festival party at about 9:30. They tend to eat dinner much later in Spain. As luck would have it, we rode down with Purita Campos. About 100 or so people were mingling or seated at long tables. On the tables were plates of blood sausages, tortillas, chorizo, and bread for appetizers. The only drinks available were beer and wine. We sat with Mike and Duncan, at an English speaking table. A group drives 1,000 km every year for the pleasure of cooking octopus for the festival guests and staff. The octopus were cooking in large pots and seasoned with garlic, salt, and paprika. Platters of sliced octopus were placed on the tables with toothpicks. They were delicious. They were also very tender, but without pounding. Sergio found out that the octopus were frozen to tenderize. The owner of the restaurant we had eaten at the first night was there, liberally pouring orujos for the guests. It was a very pleasant, though raucous, evening. We breakfasted with Mike and Duncan, then caught a taxi to the Alhambra. We posed for one of those novelty photos, dressed up as Arab sheiks. Sergio lounged on cushions with a hookah, and I stood with a rifle. It turned out wonderfully, and I can't wait to use it somewhere. The Alhambra gardens were a wonder, and this was still late winter. I can't imagine what it will be like in spring and summer. The castle was built on a hill overlooking the city, so there is a wonderful view. We took a lot of photos. We taxied back to the hotel, and had a small lunch. Sergio rested a bit, and I walked down to the festival and signed for about 90 minutes at the Expo Comics booth. I gave Emilio a can of root beer to deliver to Miguel, the guest relations coordinator for Expo. Miguel and root beer is like myself and Bitter Kas. We really like it, but it is not sold on our respective continents. Through Emilio, I met Juan Ignasias, organizer of a Malaga festival who extended an invitation for next year. I also saw my friend Kenny Ruiz. We are both published in France by Paquet, and I had last seen him at Angouleme. I wanted to buy a book of Purita Campos' work. The Glenat editor turned out to be Vasquez's son Manolo, and a fan of mine. He insisted I take the hardcover book as a gift, and offered to have her sign it later. Sergio and I bypassed the booksellers' party and the J-Pop concert in favor of a quiet tapas dinner. We found a small restaurant named Posada del Duende and had an excellent meal of local olives, shrimp in garlic and olive oil, assorted cold meats, manchego cheese, and rabbit and snails cooked in almond sauce. Everything was delicious, but my favorite was the fried whole baby anchovies. A short walk back to the hotel, a few e-mails, then out for the night. Sergio was looking for a solid attache case. European papers are of a different proportion than the US, so cases are also proportioned differently. I cannot find a case or portfolio that will handle my 12 x 18 envelopes that holds my original pages. We got suggestions from the hotel, and found a luggage store that had exactly what he needed. Unfortunately, it was the last one. The clerk gave us a card to another branch not very far away. We caught a taxi to the hotel, and had him wait while we fetched our supplies from our rooms. We had a 1:00 presentation. On the ride over to the festival center, I placed one of my originals in Sergio's case and it fit beautifully. I would have to get one as well. We arrived at the festival center at noon, and they had us do an impromptu signing. An hour later, we went to our presentation. Sergio acted as translator for me. Fortunately, he knows enough about Usagi and me that he can describe or expand on my answers to questions. It seemed to have gone well. After the "Sergio and Stan Show," a rep from a university asked if we would be interested in doing a presentation at their school near the Mediterranean. I have spoken at colleges from Johns Hopkins, to William & Mary, to Pomona College just last month. We autographed for awhile and stood for photos -- even with the Gay Cartoonists Group of Spain. Exiting the room, we ran into Juan Gimenez, the Spanish artist we had met in Mexico City a few years ago. We went to a tapas lunch with Nikki, who would later interview us on video for a French artists' organization. We had clams, mushrooms in garlic, olives, fried anchovies, chorizo, eggs with sweet ham, and fried potatoes. A new dish that we really enjoyed was the fried eggplant with honey. We each did our interviews, then took a taxi to look for the luggage store. The store had a similar model by the same manufacturer. It was even on sale. I bought it. We meandered back to the festival where we had a signing at 6. There was already a line at our signing area. It was a grueling two hours, and I was glad when it was over. We turned down party invitations and caught a taxi back to the hotel. Sergio asked the front desk for a restaurant recommendation. "Chikito -- a little restaurant." He recommended a little restaurant named Chikito. It was crowded with locals, but, after a few minutes wait, we got a table. We had a Sevillian seafood soup that was amazing. Sergio had the peppered steak, while I had roast lamb. We left Chikito about 10:30, and the streets were filled with people bar/tapas hopping or just walking. There were even children playing. Back at the hotel, checked e-mails, turned in. We breakfasted with Mike and Duncan. I had asked both these artists to do something in my sketchbook, and they did wonderful drawings. I returned the favor, and Sergio also did drawings. Both were leaving today, Mike right after breakfast, and Duncan later tonight. The pop singers had already left yesterday. We had a magazine interview at 11:00, so we walked to the festival. The line at the entrance stretched up the street. Fortunately, we could use the authors' entrance. At noon Nikki took Duncan and me up to Sacromonte, the mountain opposite The Alhambra. It has a beautiful view of the castle and city, but is also known for the gypsy cave-houses on the side of the hill. We took a taxi to the top, then walked the narrow cobbled streets. The houses there are very old, with heavy Moorish influences. We lunched at a Moroccan restaurant on kebabs and couscous, then continued down through the narrow bazaar canopied with veils, and selling such things as teas and Persian slippers. Before we knew it, we were downtown headed toward the festival center. I signed for a short time at the gay cartoonists association booth. They showed their appreciation by giving me a gift bag of a t-shirt and hat, a set of color pencils, note books, CDs, and a dozen condoms. I later did a signing at the cafe/lounge area, which ended with an interview/promo for the local news station. The 2006 Granada Festival closed at 8. I had accumulated much more than I expected -- mostly through gifts, such as a signed and sketched copy of Purita's book. We taxied back to the hotel and had dinner there. Upstairs to use the computers, then back to our rooms to pack. Day 7 -- home again! The Iberia flight departed at 7, to a gorgeous sunrise over the Sierra Nevadas. On board, we received copies of Ideal, the area newspaper. It gave an account of the festival, saying that it was a huge success with attendance close to 30,000, up almost 10,000 from the previous year. It also reported that the most sought after autographs were from Sergio and myself. It even quoted Sergio: "Granada me encanta." We arrived at Barajas, just prior to 8, and reclaimed our bags and caught the shuttle bus from Terminal 4 to Continental Terminal 1. Check-in was a long process. We both had made enough purchases that, though we arrived with one bag each, we were both returning with two, plus carry on. Sergio had bought about 10 ceramic wall hangings for water, and a couple of large platters which he hand carried. When the Continental screener asked the reason for our visit, Sergio explained we were guests of a festival and whipped out the newspaper with our mentions. We reached our gate with two hours to spare. I thumbnailed UY 97 on the flight to Newark. The lines for passport control was huge. We waited for baggage claim and stood in line to recheck our bags at Continental. There was another long line for security. We allowed a two hour window between flights, and we got to our gate just as pre-boarding had started. The good thing about Newark, is that the Continental international flight arrived in the same terminal as the domestic flights. There was no need to catch a train or change terminals, as in somewhere like Chicago or Dallas. We arrived at LAX at 6:30 pm, after spending the last 21 hours either on a plane or at an airport. Our luggage was already waiting for us when we arrived at baggage claim. We said our good byes. Sergio had driven to the airport , so he caught a shuttle to the parking lot. I had made reservations for Super Shuttle. On the ride home, there was a car fire on the 105 which shut down half the freeway. I was back in LA. As it turned out, it was fortunate that we avoided Chicago. Thunderstorms had delayed or cancelled flights coming into and departing O'Hare. That would have been a horrid end to a great trip. The Salon del Comic de Granada is a great festival. The demands on the guests are reasonable, and it is a wonderful area to explore. The people are terrific. They do speak with a dialect which is particularly difficult for me. I do not speak Spanish, but I know enough to pick out maybe one out of ten words so I can get the gist of a conversation. There I understood nothing. There were also less English speakers than at other places I have visited. This is not a criticism of the people, but I point out my own inadequacies as a traveler. They did provide an English speaking handler, but since I spent most my time with Sergio, Nikki concentrated on taking Mike and Duncan around. 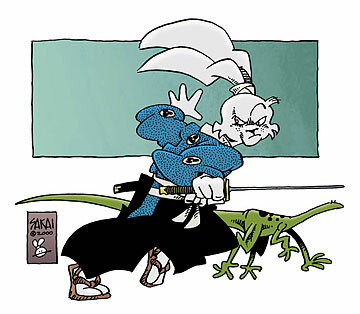 One funny incident dealing with language: A young woman ran up to me, shook my hand with both of hers, and exclaimed, "Stan Sakai -- it is a great horror to meet you!"